Russia is mediating negotiations for a political solution to the Yemen conflict outside of UN channels as a means to secure naval bases in Yemen. Russia is pursuing political negotiations with the UAE and former Yemeni president Ali Abdullah Saleh by beginning to discuss the future consensus Yemeni government. Saleh’s support for the Houthis is critical for the al Houthi-Saleh bloc to retain its influence across northern and central Yemen. The UAE may see this settlement as a way to halt the expansion of Iran’s influence in Yemen and to limit bearing further costs associated with the Yemeni war. Saleh previously expressed willingness to grant Russia military basing rights in Yemen. This basing would allow Russia to project power into one of the world’s busiest shipping lanes in the Red Sea and the Bab al Mandab strait, a global maritime chokepoint. “In the fight against terrorism we reach out and offer all facilities. Our airports, our ports… We are ready to provide this to the Russian Federation,” Saleh said in an interview in Sanaa. No one (but Russia?) took Saleh serious at that time. He was not, and is not, in a position to achieve control over Aden in southern Yemen nor any other relevant Yemeni port. I also doubted the recent report. Yes, until the early 1990s the Soviet Union had bases in southern Yemen and thousands of military advisers and trainers worked in the country. But Russia currently does not have the naval resources, nor the immediate interest, to open a new base in the area. Or so I thought. The red lights must be flashing at CENTCOM, the Pentagon and the National Security Council. For the last twenty-five years the Arab Sea, the Gulf of Aden and the Red Sea were largely U.S. controlled waters. That China recently opened an “anti-piracy” base in Djibouti has already led to concerns. Now the Russians are coming!!! The Saudi war on Yemen, actively supported by the U.S., is going nowhere. The Saudis are daily losing soldiers to Yemeni incursions (vid) into south Saudi Arabia. 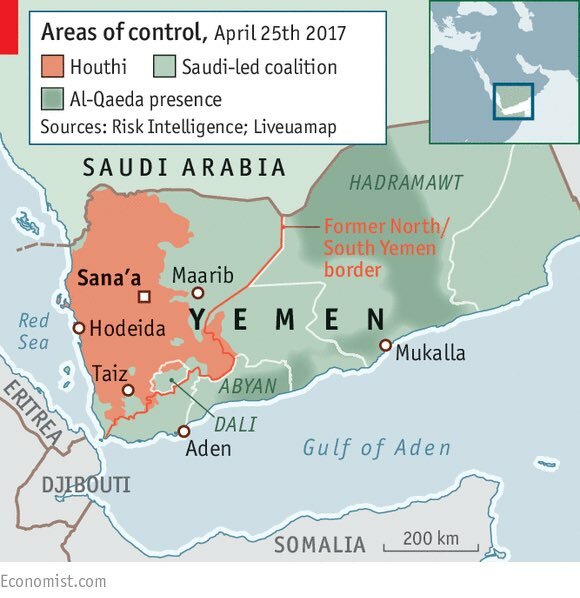 There is no chance that Saudi supported forces will take the Houthi/Saleh controlled northern Yemen and the capital Sanaa. The United Arab Emirates has supported the Saudi war with capable forces. But the UAE only wants Aden port and its nearby oil-loading facilities for its DP World port management business. The Saudis want the ports as outlets for their oil exports away from their Persian Gulf ports that Iran could easily disable. But they also want to control all of Yemen. The Saudis hired Al-Qaeda in Yemen to fight as their proxy force. But neither the U.S. nor the UAE agree to that ploy. UAE forces in Yemen were attacked by AQ. The U.S. fears AQ in Yemen as a potential source of international attacks. Since the beginning of the year the U.S. and UAE special forces have raided or bombed a number of Al-Qaeda concentration in Yemen. The Saudis were surprised but could hardly protest. Al-Qaeda was their last ace in the game. They have lost it. The Saudis are pulling back from their planned invasion on Yemen’s Red Sea coast in Hodeidah. The port is currently the only one through which food aid is shipped to the besieged and starving northern areas. The UN had protested against an attack on it and the U.S. has held back support for the operation. The Houthis and Saleh will likely agree to some UN control over the port. While the Saudis allege that the port is for smuggling arms from Iran, the Houthi know well that this has not been the case. The Saudi fear of an Iranian stronghold in Yemen is baseless. The alleged Iranian support for the Houthis never materialized. During more than two years of war no Iranian was killed, captured or even seen in Yemen. The ballistic missiles the Houthis are using against Saudi Arabia are old Soviet types including locally modified SA-2/S-75 air defense missiles. The Yemeni army had purchased and stashed many of those while Iran had never owned that type. The military supplies the Houthis use is not of Iranian origin but taken from Saudi deliveries to its proxy fighters in Yemen. The Houthi simply capture or buy from them whatever they need. There were recent protests in Aden against the U.S./Saudi puppet president of Yemen, Hadi. He had resided there for a few weeks but had to flee back to his luxury hotel suite in Riyadh, Saudi Arabia. While Hadi is officially in control and responsible for Aden no government wages have been paid, utilities are out and various gangs control and fight each other over parts of the city. Party headquarters of the Muslim Brotherhood aligned Islah party, which supports Hadi, have been burned down. The Emiratis are beginning to tire of their bickering wards. Officials who hoped that Aden would be a model for the rest of Yemen now fear that leaving the south on autopilot might only condemn the country to instability. And that might engulf the whole Arabian peninsula. Thousands of fighters they have trained have gone AWOL (after collecting their pay). Motivating recruits to push north is an uphill task even with the payment of bonuses. Those who were happy to fight for their own homes seem unenthused about fighting for somebody else’s. If the Saleh/Houthi alliance can make peace with the southern movements that so far supported Hadi, the war can be ended within a few month. Russia can moderate the negotiations and provide, to some degree, guarantees. Unlike the U.S. it is seen as neutral and sober by all sides of the conflict. The UAE and the Saudis will have to pay up for the carnage they caused. The UAE would probably get commercial Aden port rights for its DP World business. The Saudis would only get some peace within their borders. But by now the Saudis are likely to agree to such a deal – if only to keep face while ending that calamitous adventure in Yemen. As for the naval port and Russian basing rights – these are excellent bargains in negotiations with the U.S. over Syria. If the U.S. insists on controlling eastern Syria the Russians can send some submarines, a destroyer and other combatants to Aden and install some very capable air and sea defenses to keep their ships and the harbor safe. If the U.S. agrees to leave Syria alone then a small rusty Russian corvette in Aden, without air defenses, would probably do. The Pentagon and the White House would have a choice to make: keep primacy in the seas of the area or have the constant menace of a nearby Russian “fleet in being” on their back. Is a troublesome occupation of east-Syria really worth that hassle?